There’s a new mega-mammal on the menu of America’s first hunters. On a ranch in northwestern Sonora, Mexico, archaeologists have discovered 13,400-year-old weapons mingled with bones from an extinct elephant relative called the gomphothere. The animal was smaller than mastodons and mammoths, but most had four sharp tusks for defense. The new evidence puts the gomphothere in North America at the same time as a prehistoric group of paleo-Indians known as the Clovis culture, whose beautifully crafted projectile points helped bring down giant Ice Age mammals, including mammoths. 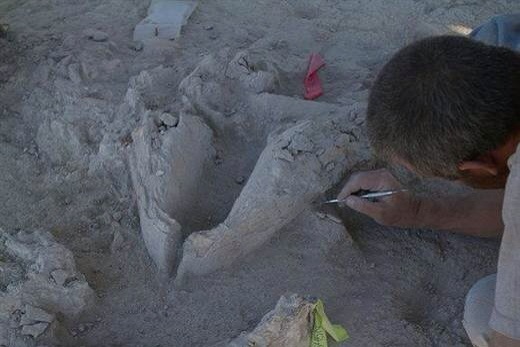 This is the first time gomphothere fossils have been discovered with Clovis artifacts. “The Clovis stereotypically went out and hunted mammoth, and now there’s another elephant on the menu,” said Vance Holliday, a co-author on the new study, published today (July 14) in the Proceedings of the National Academy of Sciences. “The implications are pretty simple, although certainly not trivial — early human explorers of interior North America opportunistically targeted the largest Pleistocene animals as part of their cultural pattern, and this pattern probably started almost as soon as people had made their way south into the lower 48 states,” said Gary Haynes, an archaeologist at the University of Nevada, Reno, who was not involved in the study. The Pleistocene epoch spans from about 2.6 million to 11,700 years ago. The blade makers also shaped chalcedony, chert, quartzite and rhyolite into blades and scrapers. However, four of the blades from the ranch are basalt, which is locally rare but looks remarkably similar to rocks at a Clovis site called El Bajio, about 112 miles (180 kilometers) to the east, the researchers reported. The gomphothere remains are from two juveniles, probably each younger than 12 years old when they died, the researchers said. The scientists also found two bone ornaments, and a piece of burned bone. The team, led by Guadalupe Sanchez, of the Universidad Nacional Autónoma de México in Hermosillo, Mexico, excavated the cream-colored rock at the behest of the rancher who owns the land. He had noticed the bones and artifacts eroding from a small cliff, and invited the researchers to dig, Holliday said. Clovis points were so popular and widespread that they still litter the ground in many places, especially in the Southwest and Southeast, including Mexico. But scientists do not agree on where the technology first emerged, or why the Clovis people invented it. The Sonoran site’s early age, combined with a similar age from a Clovis dig in Texas, suggests the culture may have risen in the South, Holliday said. 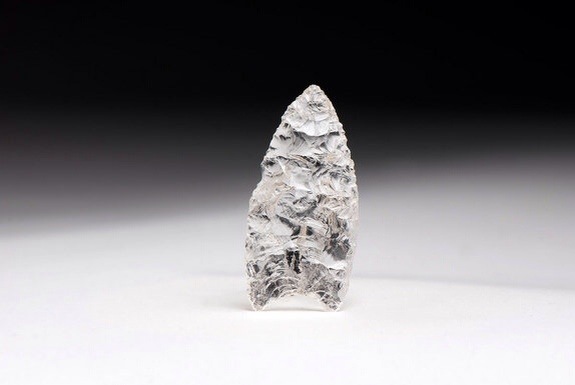 “This site opens up some new possibilities that the Clovis originated in the Southwest corner of North America or the southern half of North America,” Holliday said. Earlier this year, a genetic analysis of a Clovis-era skeleton revealed that 80 percent of today’s Native Americans, including indigenous people in Mexico and South America, share direct genetic links with this single known Clovis ancestor.